I'd put off doing this cover originally because I couldn't satisfactorily figure out a way to divide it up to accommodate the elements I wanted. 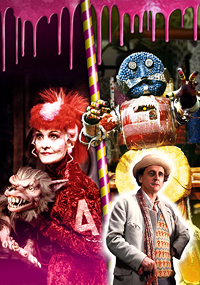 These were always the Kandyman, Helen A and Fifi (in the absence of any shot of the eponymous Patrol themselves), plus the Doctor, of course. I had thought to use an 'A' shape to give three sections (a central triangle plus space either side), but in practice I didn't feel it was clear why the shape was there, and the Doctor felt too separate from the rest of the composition. Instead I tried three panels fanning out from a point in the bottom right corner, but this created awkward shapes to fit the images into. It was only when I found a good quality shot of Helen A holding Fifi that I decided I could combine those two elements into one panel. This allowed for a simple central divide that could be positioned and angled to best fit the images. Another advantage was I didn't need to cut out the characters from their backgrounds, a particular relief given Helen A's feathery wig. I couldn't simply slap the photos together, however. Helen A's pose worked well, but Fifi's head was tipped forward, which meant you couldn't see his eyes and snarl. I therefore did a headswap on him, to had lots of fluffy fur to cut out after all. Similarly, the best quality shot of the Kandyman I could find had him with both arms outstretched, whereas I really liked the shot with one arm reaching forward to grab the viewer. The former also didn't fit the narrow space as comfortably, as one hand would disappear off the right-hand edge of the cover. It was the only photo I had that showed the detail of the costume clearly, however, so a bit of surgery was required. The main photo is scanned from a cover of DWM, being large and detailed. This had the logo right behind his head and text over much of his lower body, so I patched in these areas from another DWM scan that was big but grainier and split down the middle where it had been printed across a spread. I then replaced his left arm with a screengrab from the DVD of the reaching-out version, which was soft but could get away with it given the depth of focus on the outstretched arm. This cover completes the McCoy era, pending any further re-releases. I'm much happier with my redone cover for 'Delta and the Bannermen', and while the shot of the Doctor on the re-worked 'Remembrance of the Daleks' is still not perfect it's probably as good as it'll get short of being given access to the BBC's photo library. The next oldest after that is 'The Curse of Fenric', which I could probably tinker with if they re-released it but I'm happy with it as it is.